Zamek Lubliniec is situated in the center of Lubliniec, in the Upper Silesia region, close to a picturesque park. Its luxurious rooms offer satellite TV and free Wi-Fi. The hotel is housed in a 13th-century restored castle, with modern rooms overlooking the castle park. All rooms feature a DVD player and a private bathroom with a hairdryer. In the Baroque dining room, guests can enjoy international and Polish dishes. The bar in Zamek Lubliniec offers a wide range of drinks. Guests of Zamek Lubliniec can enjoy free parking and 24/7 front desk. Hotel Alhar in Lubliniec offers modern, air-conditioned rooms with free Wi-Fi and an LCD TV. There is a restaurant serving Silesian and Polish cuisine, as well as Mediterranean delicacies. Each room at the Alhar is spacious, with elegant interior décor. There is a private bathroom with bath or shower and a hairdryer. 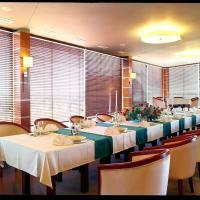 The restaurant serves a wide variety of dishes à la carte, as well as numerous hot and cold drinks. Room service is available. Hotel Alhar includes a 24-hour front desk service and free private parking. There is a beautiful Grunwald Park nearby and the town centre is 1.5 km away. The train station is 2.5 km away.